Loyalty Programs for your hotel / motel - Reward your visitors! Are you a hotel or motel that truly wants to practice customer retention but doesn't want to spend the majority of your marketing budget on a loyalty program? Loyalty Gator is your perfect solution. Get an edge over the competition with your own loyalty program. Loyal customers spend more money. 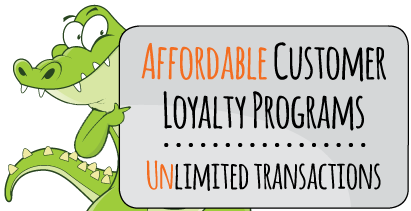 Loyalty Gator is an affordable customer retention program that's customized for your business.Increase traffic, spending, and word of mouth with a rewards program for your customers. Plus, start tracking your visitor activity to pin-point your most loyal customers, how often they're visiting, and what motivates them. How would you use loyalty gator to benefit your hotel/motel? Offer incentives such as "refer a customer and get 500 points"
Encourage repeat visits - "stay 3 nights, get 1 night free"
Offer incentives such as "buy 2 items from the mini-bar and get 1 free"
The options are endless... Tell us how you want to create your own program or allow our loyalty marketing experts to develop a custom solution just for you. Contact Us today to learn more about how a loyalty program can benefit your business! Add employee rewards or a gift card program...free! A great company is fueled by great employees. See how important employee loyalty is to your company. Want to offer gift cards to your customers? Check out our gift cards program here. Loyalty Gator clients on any customer loyalty program paid plan can now add a gift card program and an employee rewards campaign... at no additional cost (except cost of physical cards if needed). No transaction fees, marketing support, secure data, employee access control, customer reports, automatic transaction emails, and no contracts is just a few Loyalty Gator features.